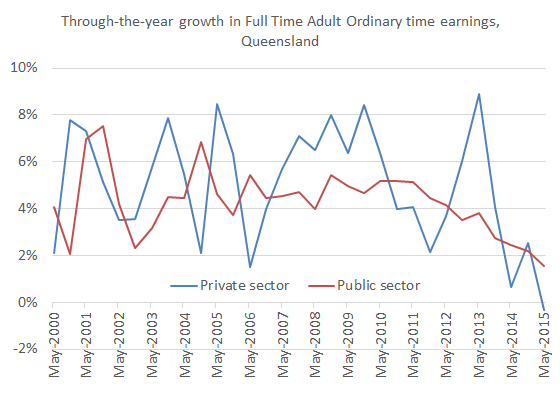 New ABS data released yesterday show that average weekly ordinary time earnings in the Queensland private sector fell slightly, by 0.4 per cent, through-the-year to May 2015, no doubt associated with the loss of high-paying jobs in the resources sector at the end of the mining boom (see chart below). This contrasts with positive growth in private sector average weekly earnings nationwide of around 2 per cent. Compare the disappointing recent performance with the high growth in private sector average weekly earnings that existed when the boom was underway: nearly 9 per cent growth through-the-year to May 2013. This entry was posted in Labour market, Mining and tagged averageweeklyearnings, awote, mining, miningboom, privatesector, publicsector, qld, queensland. Bookmark the permalink.